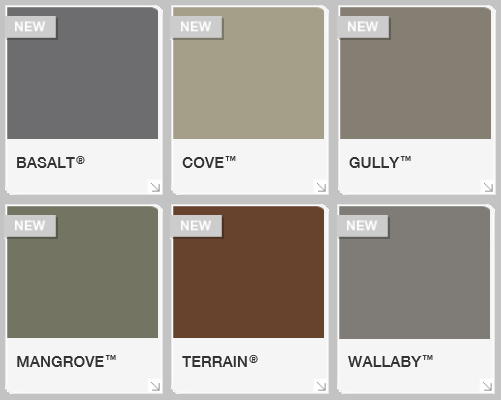 Lysaght have recently rationalized their Colorbond® colour range, making the following deletions and additions. Deletions. If these colours are still required for supply after 1/01/2014, they will be treated as a custom colour attracting a premium. If there are projects of which you are aware and will need the deleted colours, please allow additional time for processing and delivery, as custom colours do take longer. While Lysaght also discontinued ‘Wilderness’ as a standard colour, due to significant customer demand AMIA will still be offering all our window and door products in this colour as a standard option. ***Special Note – When clear anodized was taken from the range earlier this year, it was replaced with Anodic Clear. This is very close in colour to Shale Grey and has been the cause of some cases of “mistaken identity”. To end this and to have our colour range match what Lysaght have as their Classic and Contemporary range of Colorbond® colours, we will be ceasing production of this colour at the same time as these other changes. Additions. The new colours will be introduced to our stocks of material during November. Delivery will be available by the last week of November. Click Here to view the additions to the Colorbond® range that AMIA will be offering across our range of products.